If you will be living in Germany, or just visiting the Frankfurt area, you need to know that Frankfurt has two airports. One is the Frankfurt Main Airport, and the other is the Frankfurt Hahn Airport. Frankfurt Hahn is approximately 112 km/70 miles from the Frankfurt city center. 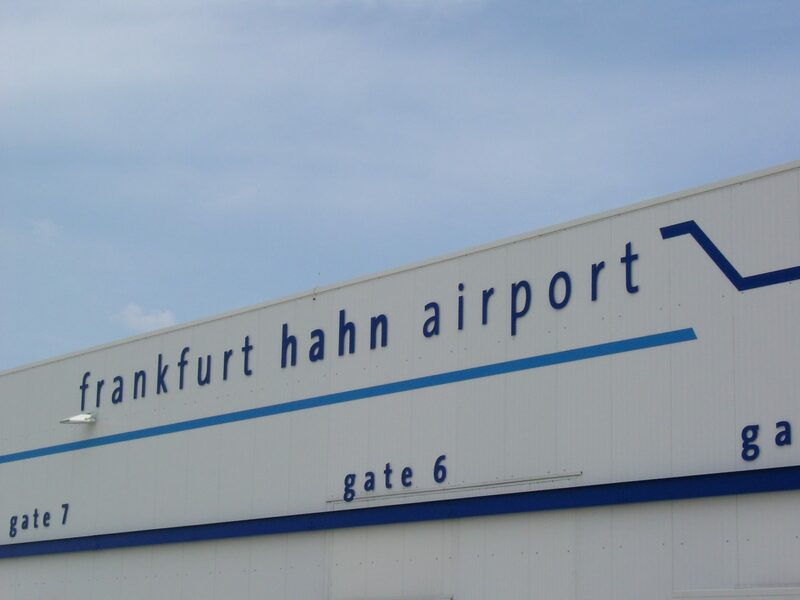 The Frankfurt Hahn Airport is not accessible by train, so you need to make arrangements to get to and from the airport. Here is our guide on how to get to Frankfurt Hahn Airport, and has been updated as of 4/2017. Why fly to Frankfurt Hahn? The Frankfurt Hahn airport is smaller and caters to the low-cost airlines. You can often find flights in and out of Frankfurt Hahn for as low as 25€, one way. Once you find your way around, it is very easy and will save you a ton of money! It is small enough to find your way around with no problems. Terminal 1 and terminal 2 both lead to the main street. Everything is walking distance, including the shuttle buses. Who flies into Frankfurt Hahn? The largest airline is Ryan Air followed by Sunexpress, Wizz Air, and few other smaller airlines. If you are looking for a low-cost way to get in and out of Frankfurt (and the surrounding area), this airport is the perfect solution. 1. Taxi – Taxis are in front of terminals. They can be caught quite easily, if you don’t mind the cost. Mainz is the closest town and is roughly one hour from Frankfurt Hahn. The cost is approximately 98€. From the Mainz Train Station, you can catch a train anywhere you want to go. If you fly in late at night, taxis are harder to find so it would be better to book one in advance. Here are a list of taxi services that will help you get from Frankfurt Hahn into the city – Taxi Service. Most taxis in Germany will accept credit cards, but ask before you go. 2. Rental Car – There is a rental car counter at the Frankfurt Hahn Airport; it sits between terminal 1 and 2. You can book in advance or rent a car on the spot. If you rent on the spot, cars are limited and typically manual transmission. If you arrive late at night, or early in the morning, you need to book ahead because the counters will be closed. Here is the link to the rental cars at Frankfurt Hahn; it is better to reserve ahead. Compare Rental Car Prices here. 3. Shuttle Bus Service – The shuttle bus service is the most cost-effective way to get to and from Frankfurt Hahn Airport. There are shuttle buses that will get you to most of the surrounding local train stations and a few airports. Here are all the options for shuttle bus service. They are very easy, so don’t be intimidated to try them. You will find many people at the airport who speak English and most of them will be more than happy to help you if you need it. There are two places to catch shuttles at the airport. Some buses stop directly in front of the airport terminals and other buses leave from the Frankfurt Hahn Bus Station, which is only a three-minute walk, 250 meters from the terminals. This is the fastest and most efficient way to get to and from Frankfurt Hahn Airport. After collecting your luggage, walk directly outside the terminal and follow the signs for the airport shuttle bus. The bus stops directly outside the terminal. This shuttle will take you directly to the main train/bus station in Mainz. You can purchase shuttle bus tickets directly from the bus driver. You will need cash; no credit cards are accepted. The cost is 13.50€. If you are returning via shuttle bus, buy a return ticket for 19.80€. Here is the shuttle bus schedule from Frankfurt Hahn to Mainz Train Station. Your travel time is about 70 minutes. This is the fastest way to get from Frankfurt Hahn to a Train Station and from there you can catch a train or a bus to any destination. From the Mainz Train Station you can get anywhere in Germany via the German train system. Book your train tickets early (90 days), and you will normally get very reasonable prices. You can book both trains and buses, look at timetables here —> Compare Prices Here<— Put your starting destination as Mainz Hbf, add your final destination, and then hit “search.” You can purchase tickets online and print them at home. Super easy; we use the trains all the time. The bus stop is at the main train/bus station in Mainz. The bus stop is next to taxi stand N – there will be signs for the airport shuttle and the yellow H. You buy your tickets directly on the bus from the driver. Shuttle schedules are here. The bus stop is at the Frankfurt Hahn Bus Station about 250 meters from the airport. There is a free shuttle bus directly outside of terminal 2 which will take you to the bus terminal. You can also opt to walk (less than three minutes.) The bus stop is #7 and is clearly marked. The trip to Koblenz takes about 1 hour and 10 minutes, and the cost is 11.30€. If you are going to Cologne, it takes about 2 hours and 45 minutes, and the price is 16.00€. The timetables are located here. You can purchase your tickets at the ticket counter in terminal 2, directly on the bus, or here – onlinetickets. This route is run by Bohr bus lines. If you are going farther than these stops, you can purchase train tickets from these destinations at bahn.de. Your train stations will be Koblenz Hbf or Cologne Hbf. The shuttle bus back to the airport can be caught at the Cologne Hbf/Central Station. The main entrance faces the Cologne Cathedral. The back entrance faces Breslauer Platz. If you are looking at the back entrance, the bus stop will be on your left, next to the SBahn tracks. Follow the signs for the bus stop/taxi stand. It is clearly marked with a yellow H. You can purchase your ticket directly on the bus. The price is 16.00€, and the total drive time is 2 hours 45 minutes. Or for a quicker time, you can take the train or bus from Cologne HBF, to the Mainz HBF and then take the shuttle (above Mainz to Frankfurt Hahn) You can compare bus and train tickets here. The shuttle bus departs from Koblenz Hbf. and leaves from bus stop 1. Tickets can be purchased directly on the bus for 11.30€. Drive time is 1 hour 10 minutes. Schedules for Cologne/Koblenz-Frankfurt Hahn are here – bus schedule. You can buy your tickets directly from the bus driver at any of these stops, however, it is less expensive to purchase them online and print them at home. The bus company is Flibco and the buses are white and green. You can purchase tickets for this route on their website – Flibco.com. Round trip tickets will save you money if bought together, and children under 10 travel for free. Prices start at 12.00€ per person and go up to 40.00€, depending on how far you travel. At Frankfurt Hahn, the bus leaves from the bus stop located directly in front of terminal 2. You can find all schedules and purchase tickets here – Filbco.com. Buses are located directly in front of terminal 2, outside the arrivals door, at stop #14. You can purchase tickets from the ticket booth inside the terminal, on the bus, or online at www.bohr.de. The cost is the same no matter how you buy them. The fee is 14.00€ per adult and 8.00€ per child. The buses are run by Bohr and the insignia on the side of the bus is Entega. The drive time is about 1 hour and 45 minutes. The bus stop is located on the south side of the main station at Mannheimer Str. Look for the bus lanes that run alongside the parking lot area. The stop is marked with a “RYANAIR/Bohr” sign. Getting to The bus leaves from bus station terminal 2, opposite of exit E9 in the airport. There is a shuttle but that will transport you between terminal 1 and 2. Once in terminal 2, follow the signs with the white bus – it will take you to the airport shuttle stop. For either trip, tickets can be bought online or on the bus. Fares are 14.00€ for adults and 8.00€ per child. Timetables can be found here – Frankfurt to Hahn. This bus runs to the south of Frankfurt Hahn and can be caught directly outside of terminal 2. The bus company is Hahn-Express, and the buses are white and blue. They will be going toward Baden-Baden Airpark. Tickets can be purchased directly on the bus from the driver only. The driver will only take cash, no credit cards. The price varies based on your length of travel. They start from 18.00€ and go up to 36.00€. If you purchase a return ticket, the price is cheaper. Children up to the age of 14 travel free with an adult. Fares and schedules can be found here – Hahn-Baden-Baden. Time schedules can be found at Hahn Express and the details of stops and times at Hahn Express. There you have it – the whole scoop on how to get to Frankfurt Hahn Airport like a local. Now you can fly more often, and much cheaper, by using your local guide to Frankfurt Hahn. Don’t be intimidated – it is really very easy and all the stops and buses are clearly marked. The airports and train stations are all used by foreigners, so you will always find someone to help you if you are unsure. Have you flown in or out of Frankfurt Hahn? Do you have any great tips to share? I would love to hear them! Leave a comment below. I want to thank the Frankfurt Hahn Press/Media Department for providing BasketsLife with all the photos from the Frankfurt Hahn Airport. They have a great website with a lot of information – Frankfurth-Hanh-Airport. You can check the status of flights, updates, news, and shuttle schedules 24 hours a day. Please be advised that Baskets Life Travel is an affiliate partner of travel sites to bring you the best prices, locations, hotels, car rental and flight options. If you click on a link, we could receive payment, goods, or compensation. We only promote travel we have personally used and know you will love, too. All opinions are our own. I can buy the bus tickets directly to the driver. Shouldn't it be better if I book them online? Thank you so much to who ever wrote this article. I was panicking this morning and this guide helped me get to hhn. Thank you, thank you, thank you!